The old moated Compton Beauchamp House was the home of the King's Councillor, Sir Thomas Fettiplace, from about 1507. His only daughter, Elizabeth, married the notorious Catholic, Sir Francis Englefield. When his Englefield estates were all confiscated and he fled abroad, she was allowed to retain Compton as her residence. Elizabeth had no children and the property passed to her Fettiplace cousins who took little interest in the house. 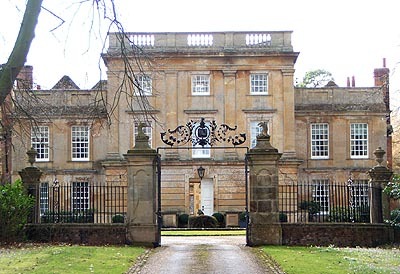 In 1589, when arranging the marriage of Richard Fettiplace to Eleanor, the daughter of Sir Henry Poole of Sapperton House in Gloucestershire, the family found itself obliged to clear its debts by selling a number of manors. Compton was one of these and it was actually sold to Sir Henry himself. The old house must have been in some state of disrepair by this time and Poole appears to have pulled it down and replaced it with the present house around 1600, possibly a little earlier. Perhaps he used it as a lodge for hunting on the Berkshire Downs. His son sold up in 1617 to Sir Gabriel Pyle. The house eventually passed to Sir Gabriel's great grandaughter, Jane, and her husband, Edward Richards. Their son, also Edward, married, in 1710, to Rachel Warneford and decided to impress his new wife by the erection of a fashionable Palladian facade on the Eastern entrance front of his little Tudor manor house. The couple's initials are intertwined on the elaborate wrought-iron entrance gates. The house passed to their only daughter, Ann, in 1728. She was an extremely beautiful, yet somewhat eccentric lady. Suitors flocked to her door in droves, but she would marry none of them. Her passion was not for men, but for hare coursing, in which frequently indulged up on the Downs at Ashdown: "At books she laughed, at Pope and Clarke, and all her joy was Ashdown Park". Compton Beauchamp House is a private residence. However, it can be clearly seen through its entrance gates.